Today Current affairs of 27th August 2018 we mentioned here in this web page. 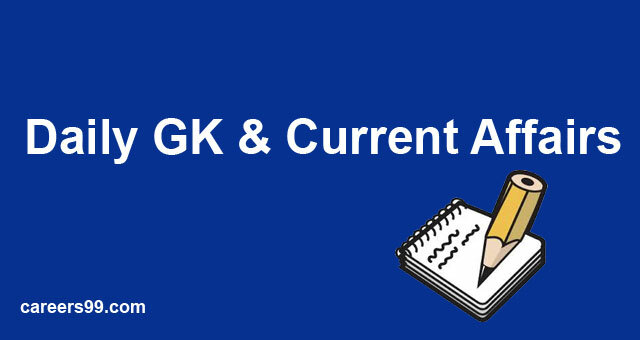 People who are preparing for the upcoming Competitive Examinations for those citizens we are helping to you to guide the Daily GK Current Affairs of 27th August 2018. In this website you can the complete details of current affairs and Daily Events in the world etc and so on. Citizens watch this web page and get the current affairs every day. Try to attempt all the bits correctly. Indias 1st Bio Fuel powered flight landed in Delhi, covering the distance between Dehradun & Delhi. The Biofuel is developed by CSIR Indian Institute of Petroleum, Dehradun. It was successfully completed by Spice Jet. The flight was powered by a blend of 75% air turbine fuel (ATF) and 25% bio jet fuel. The advantage of using bio jet fuel as compared to ATF is that it reduces carbon emissions and enhances fuel efficiency. Tamil Nadu Chief Minister Edappadi K. Palaniswami laid the foundation stone for setting up of a Special Investment Region (SIR) in northern Krishnagiri district to attract investments. The foundation stone for the Rs 2,420 crore projects was laid through video conferencing from the State Secretariat. The SIR would be jointly developed by GMR Infrastructures Limited and the Tamil Nadu Industrial Development Corporation Ltd (TIDCO). The Statistics from 14 cities across India have been analyzed by Centre for Science and Environment (CSE), the New Delhi-based think tank, to check how some cities, which hold sizeable shares of India’s urban population are positioned in the race for clean and low carbon mobility. Bhopal tops for lowest overall emissions and energy use from the urban commute. The analysis titled The Urban Commute was released in Kolkata. India Banking Conclave 2018was held in New Delhi. The India Banking Conclave 2018 was organized by Centre for Economic Policy Research (CEPR). Knowledge Partner of the conclave was NITI Aayog. The conclave focused on reforming the banking sector. “Atal Ji Ne Kaha”is the latest of the books on the BJP patriarch and former Prime Minister Atal Bihari Vajpayee launched with a message by Prime Minister Narendra Modi. The book is Authored and compiled by Brijendra Rehi.Mr. Rehi is noted Doordarshan producer and senior journalist. The book has been published by Darpan Publication. External Affairs Minister Sushma Swaraj began her four-day tour of Vietnam and Cambodia, with an aim to deepen India’s strategic cooperation with the two key nations in the ASEAN region. She will inaugurate the 3rd Indian Ocean Conference in Hanoi. In Vietnam, she will co-chair the 16th meeting of the Joint Commission along with her Vietnamese counterpart, Pham Binh Minh. In Sri Lanka, the fourth Asian electoral stakeholders forum (AESF-IV)begins in Colombo to discuss the state of elections and democracy in the region. The two-day forum is being held for the first time in South Asia with support from the Election Commission of Sri Lanka and the Asian network for free elections (ANFREL). The 8th meeting of India-Kenya Joint Trade Committee was held in Nairobi, Kenya.The meeting was co-chaired by Union Minister of Commerce & Industry and Civil Aviation, Suresh Prabhu and Mr Peter Munya, Cabinet Secretary (Minister) for Industry, Trade and Cooperatives, Government of Kenya. PepsiCo’s India-born CEO Indra Nooyi will be honored with the Game Changer of the Year award by a global cultural organization Asia Society in recognition of her business achievements, humanitarian record and advocacy for women and girls around the world. Reliance Power has announced that its wholly-owned subsidiary Reliance Power NetherlandsBV has won an international arbitration award of $56 million (Rs 390 crore) against Prestige Capital Holdings (a Seychelles-based company) and Kokos Jiang.